Our unique, one-of-a-kind works of art perfectly accentuate the perception of shapes and colors as well as the story and the appearance of the wearer. They are meticulously designed and handmade by master craftsmen using only the best materials to exacting quality standards. We are particularly proud of this signature necklace model, which we designed and hand-forged. 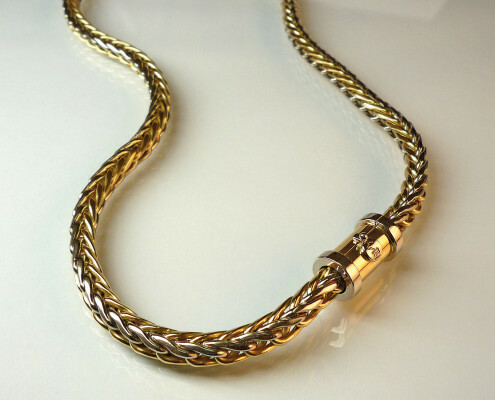 The necklace pictured here was threaded with alternating 18k White and Yellow Gold eyelets for an attractive yellow/white striping pattern. The matching Wolfschmiede clasp is designed to allow the necklace to move freely with the body so that it wears beautifully and is always comfortable. Pendants that match the diameter of the necklace may also be attached. We can custom-make the Wolfschmiede Collier for you in any color, diameter or length and the clasp can be personalized with a variety of gemstones. 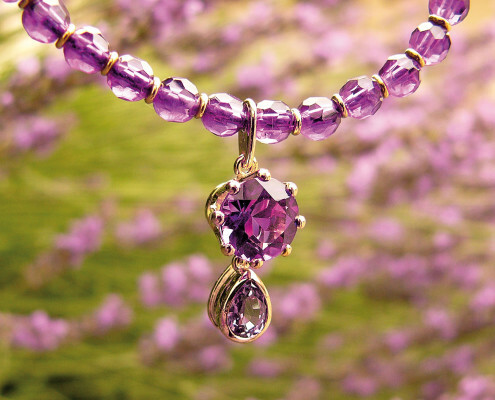 This amethyst collier is as delicate and finely wrought as the legendary lavender blossoms of Provence, France. 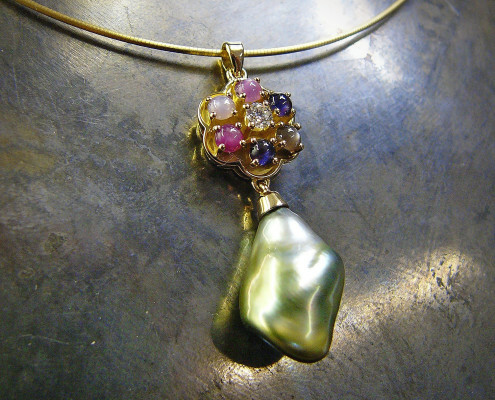 Decorative elements in gold offset the intense color of the amethyst pearls. The brilliant-cut amethyst of the pendant was embedded in a forged, hand-filed crown setting and ends in a teardrop-cut purple sapphire. It was a customer who named this gold structure for us when he remarked that it looked like elephant skin. We thought it was so fitting we immediately adopted the term. The coarser structure is very robust and therefore perfect for daily wear. 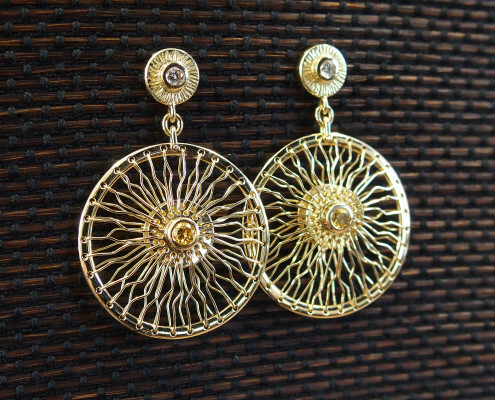 We have embedded the structure in fine yellow gold bezels polished to perfection that are extremely soft on the skin. 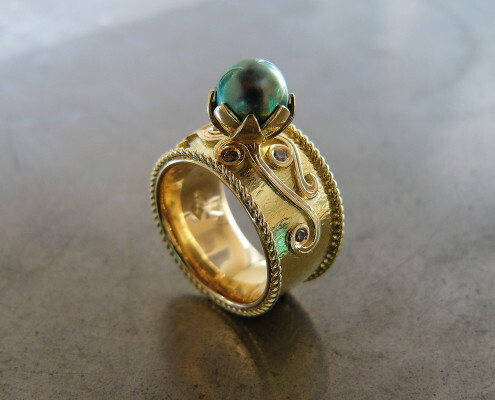 The interior base ring is also fashioned from yellow gold. A comfortable double curb chain bracelet that is perfect for everyday wear. 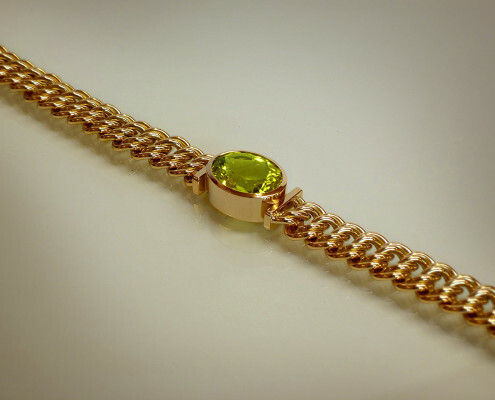 This bracelet was handcrafted from of 18k yellow gold with a rare canary tourmaline 7.73 ct. Wearing this kind of jewelry is simply fun. Elaborate 18k yellow gold bangle. 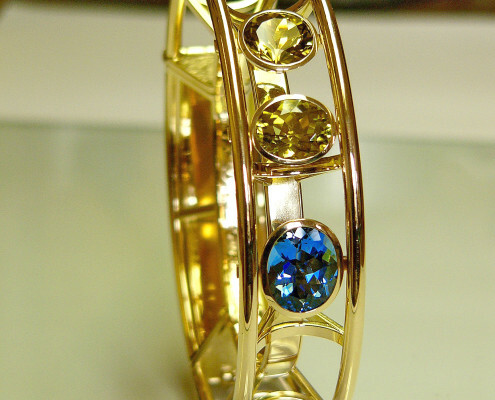 A special order by a client with an aquamarine from Mozambique and two canary-yellow tourmalines. The request was clearly worded: The bangle should be lightweight, so the precious gemstones can “float” as freely as possible. The view should not be unnecessarily marred by settings. This bangle is one of Wulf’s favorite creations. He built it, while I was particularly enthusiastic about the clasp mechanism and the perfect detailing. 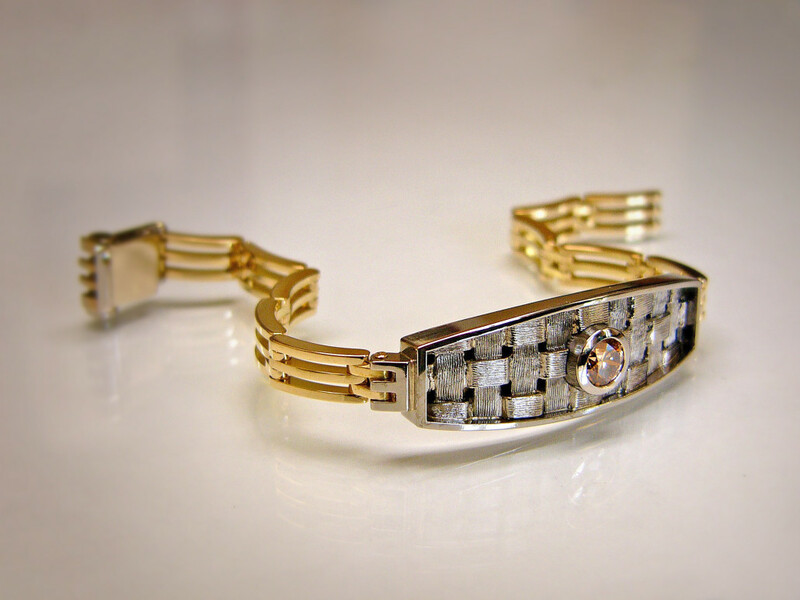 A chain bracelet crafted from a specially manufactured, woven palladium sheet with one 1.01 ct brilliant-cut diamond. The surface was engraved using a graver; the bracelet was assembled from a multitude of individual pieces in yellow gold. 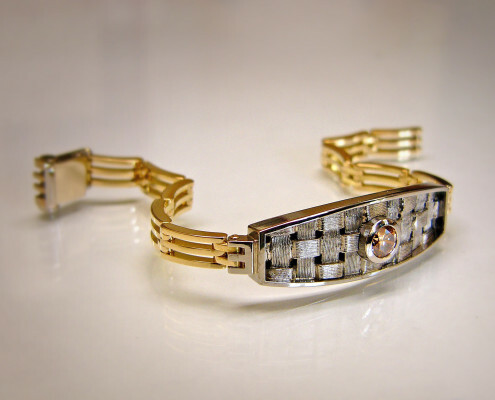 The matching clasp was designed specifically for this bracelet – it reaches into the gaps in the bracelet like a rake to close it. 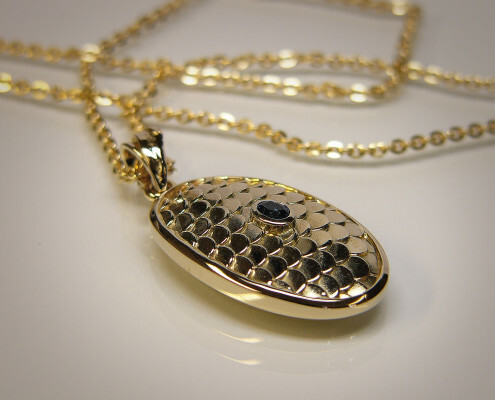 This handcrafted 18k Garibaldi necklace is wrought n two colors. What is unique is that the classic chain link pattern named after the Italian general Garibaldi, was worked in a voluminous, balloon-like pattern. A box clasp was worked into the necklace to secure it. Fine Wolfschmiede collier in 18k Pd white gold. The pendant was built up in multiple layers of structured gold. When choosing the gemstones, we opted for precious alexandrites. Due to their natural pleochroism, they appear red in artificial light and green in natural sunlight. Amulet with Indian moonstone and demantoid. 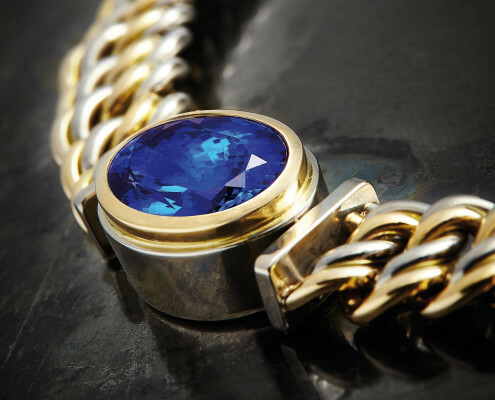 The 18k gold bezel was made from yellow and white gold using a sweltering technique. 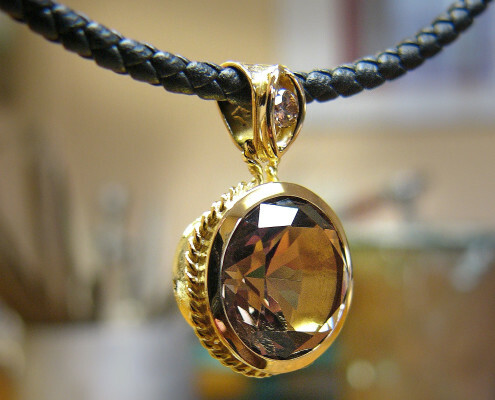 We designed the overall concept of this 18k yellow gold pendant with smoky quartz. The main pendant loop is integrated into the design by means of the navette-set brilliant-cut diamond. The very plainly set smoky quartz is encircled by a gold cord wire as an understated decorative element. 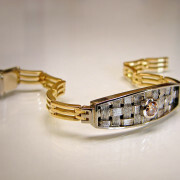 We reworked old jewelry the client no longer wished to wear into various combinations of new jewelry. Three natural gray brilliant-cut diamonds on each earring are set in gold bezels and firmly interlinked with a hinge mechanism while remaining extremely mobile. 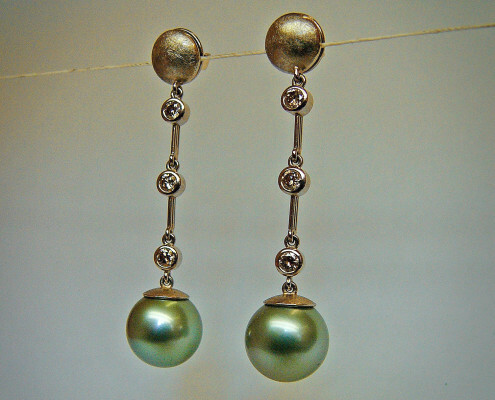 Two delicately mounted and suspended Tahitian pearls in gray complete the earrings. The inner ring was forged from yellow gold and polished to a high gloss, making it wonderfully soft on the hands. The outer ring was forged from a structured white gold sheet and wrapped around the yellow gold ring. Parts of the yellow gold ring remain visible when viewed from the top. The couple’s initials were embedded in finely carved „spyholes“. Natural-colored brilliant-cut diamonds enhance the women’s ring. The solitary diamond is 1.42 ct. This solitaire ring in 18k yellow gold was fashioned in several layers with differently structured gold sheets. The ring continues to change appearance along the entire circumference. The beautiful brilliant-cut diamond has a weight of 0.99 ct.
Each and every ring we craft in this manner particularly highlights its uniqueness. 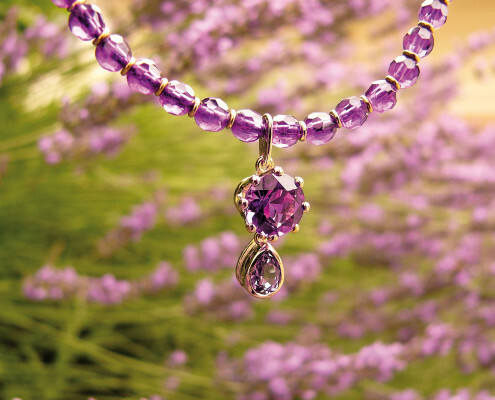 Detail-rich floral pendant made of star sapphires in violet, gray and green pastel hues. 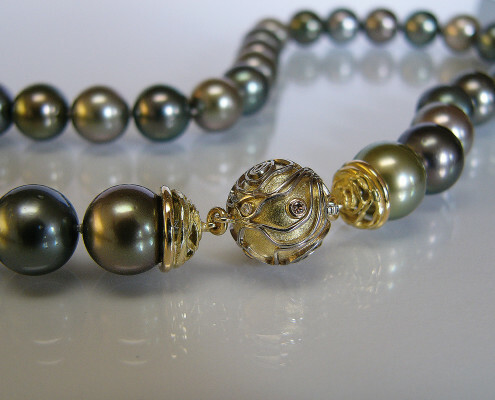 The Tahitian Keshi pearl was taken from our stock, the treasure chest where we lovingly stash away our most precious finds over the years. Women’s collier made of African amethysts and a teardrop-shaped purple sapphire from Tanzania with forged elements in 18k yellow gold. 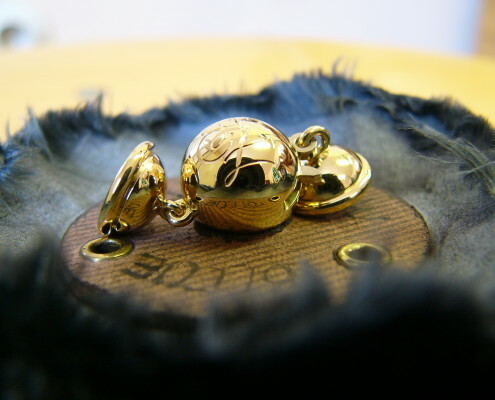 This forged and engraved ball clasp in 18k yellow gold was created to the specifications of our clients for their upcoming golden wedding anniversary. The customer had gathered information long beforehand and knew exactly what he wanted. He found what he was looking for at Wolfschmiede. 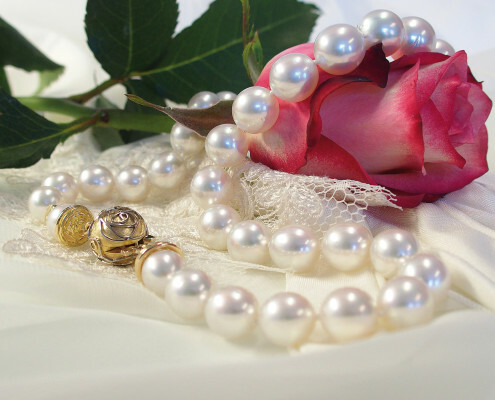 With closed eyes and only by touch, he selected South Sea pearls of the perfect luster. The necklace is resplendently glorious and we were delighted to have the opportunity to work with such magnificent materials taken straight from nature. 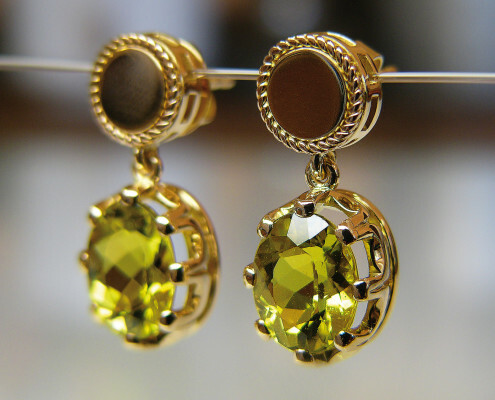 For these 18k yellow gold earrings, we found two tourmalines in a unique color. They shine in a gorgeous lemon yellow. The prong settings were first forged, then carefully cut out and filed by hand. The fineness of the prongs requires maximum focus, since it is all too easy to cut into a prong – which means we have to start over. 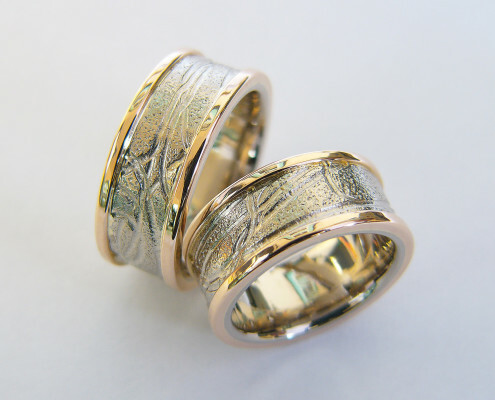 Wedding rings in 18k rose and palladium white gold with “elephant skin” structure. This amulet for men was made from a specially-woven palladium sheet. A steel-blue, square-cut aquamarine is set in an understated bezel setting. The amulet is worn on a leather cord. 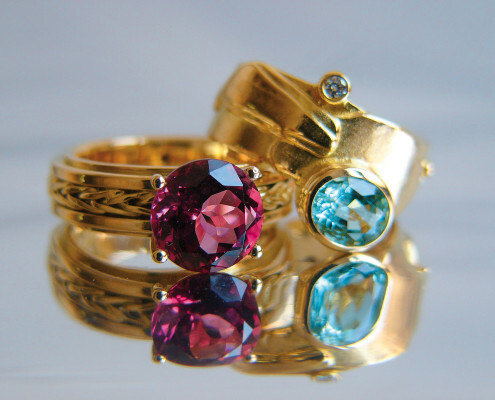 with a rose tourmaline as the centerstone set in yellow gold. Forged yellow gold ball clasp with soldered wire in 18k palladium white gold. The gemstones were taken from heirloom pieces provided by the client. 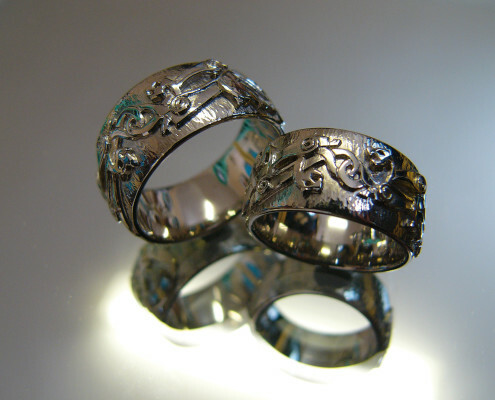 Wedding rings forged from 18k palladium white gold at the request of tour clients. 18k women’s ring in yellow gold featuring natural, cognac-colored brilliant-cut diamonds. The conical shape of the beautifully hammered ring band makes it comfortable in spite of the width of the ring. We developed unique ornaments for this client that are additionally decorated with fine engravings. These are lined by golden cord wire. In order to enhance the three-dimensional visual, we worked in raised gold wires. Wedding bands in 18k palladium white gold. After working a sheet of 18kt palladium white gold, engraving it and creating structure, we cut out and shaped these two wedding bands. 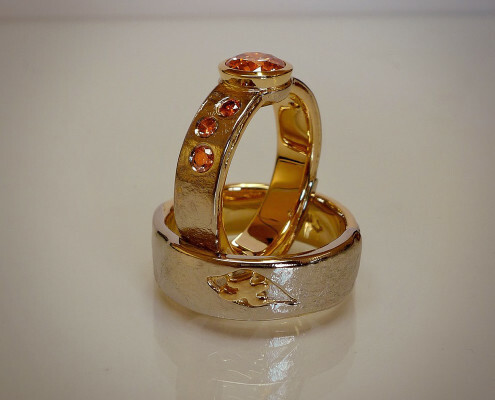 When the finished rings are held next to each other, you can see that they belong together. Tahitian pearl ring in a baroque style, richly ornamented, featuring brilliant-cut diamonds. 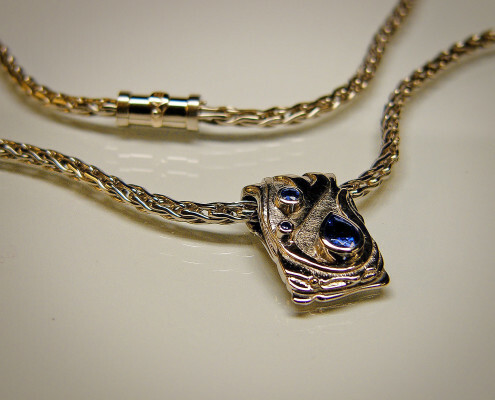 This classic amulet was fashioned for a dear client from jewelry she no longer wanted to wear. We took the oval sapphire from one of her rings and placed it in a new bezel setting. It is now resplendent in its new setting while still being the bearer of all her beautiful memories. Extravagant 18k women’s ring for a woman like no other. 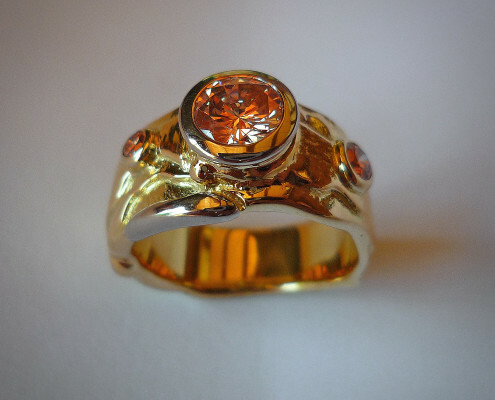 The beautiful coral is a family heirloom that we reworked and polished for our client. 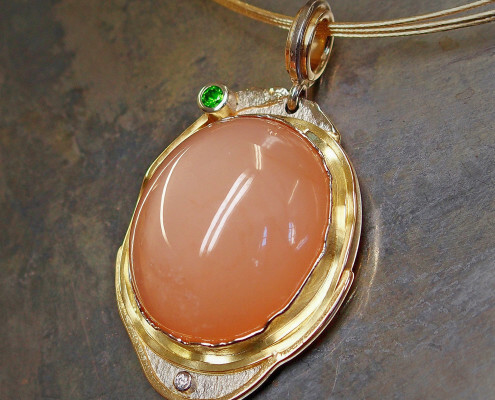 It is flanked by boulder opals in the complementary color, which heightens the tension. The ring band features a scale pattern of exquisitely soldered, tiny gold plates. This creates an overall impression reminiscent of the fresh colors of the Indian Ocean. 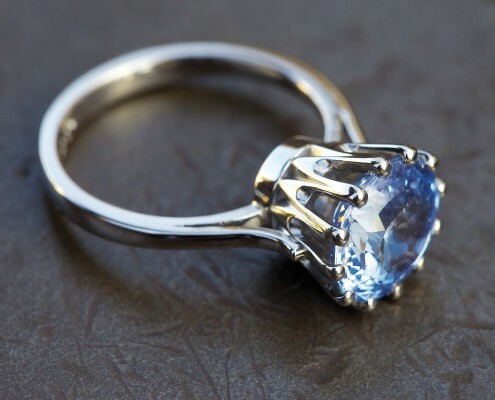 Classic women‘s ring in 18k palladium white gold and a forged, hand-filed 12-prong setting for a light blue 5.88 ct sapphire from Ceylon. The prong setting is first forged, then carefully sawed and filed by hand. Due to the extremely fine prongs, this work requires maximum focus, because it is all too easy to cut into a prong – which means we have to start over. The forged ring band lends hardness to the filigree ring, making it very robust in spite of its fine structure. 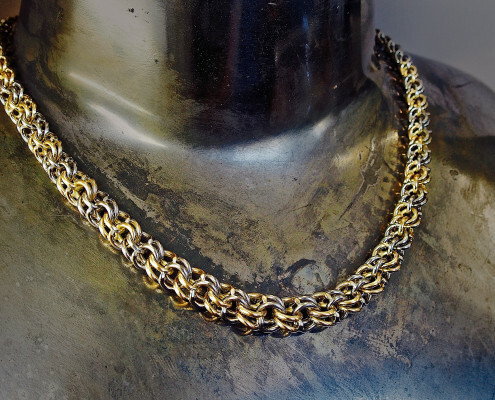 This double curb chain collier was continuously wrought with yellow and white gold eyelets. 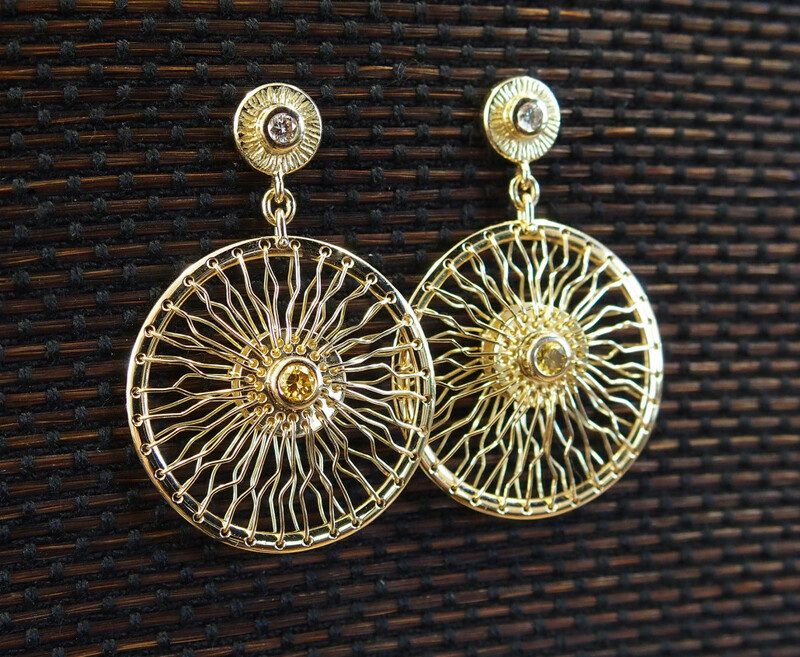 It was preceded by comprehensive studies, because the continuous pattern changes both the size of the eyelet and the diameter of the round wire used. 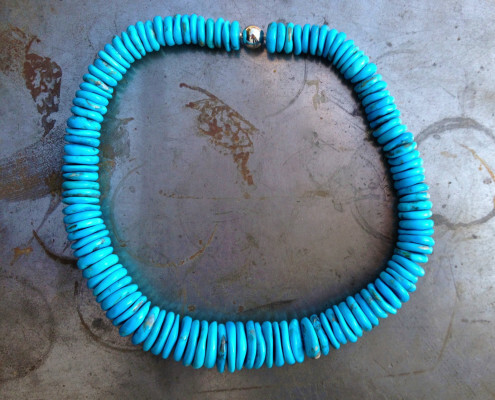 This is done in a way that makes the spaces between the eyelets appear perfectly even along the entire necklace. The upper part is meant to be in white and the lower in yellow gold. 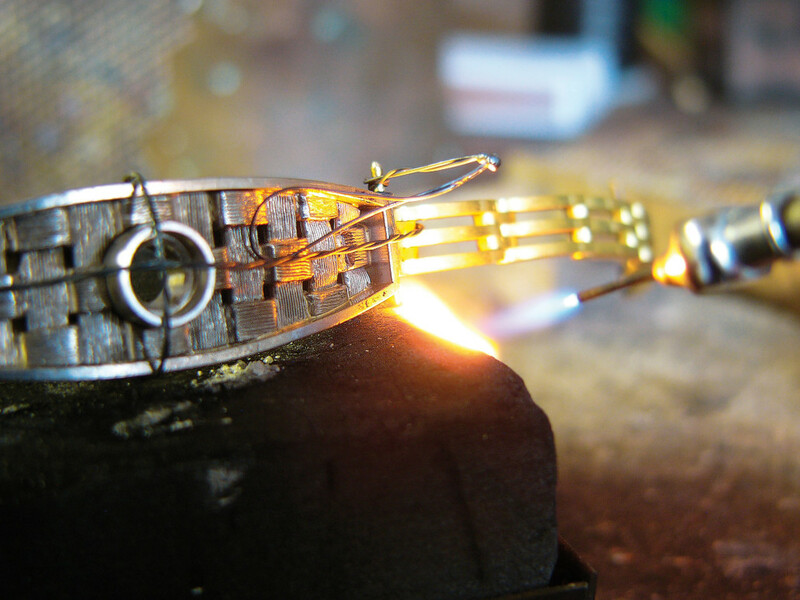 In order to prevent the different-colored eyelets from twisting and the colors from mixing, we had to come up with a labor-intensive soldering technique on the back of the collier. 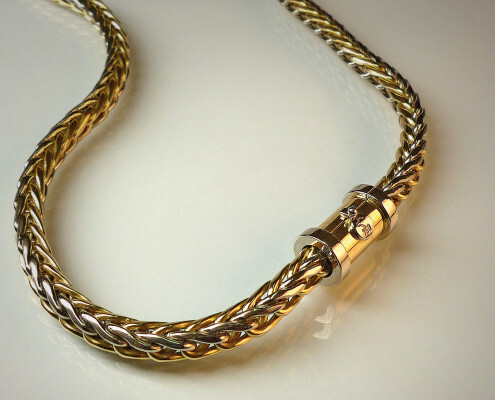 The rear third ends in a simple curb chain – in yellow gold on the left and white gold on the right. 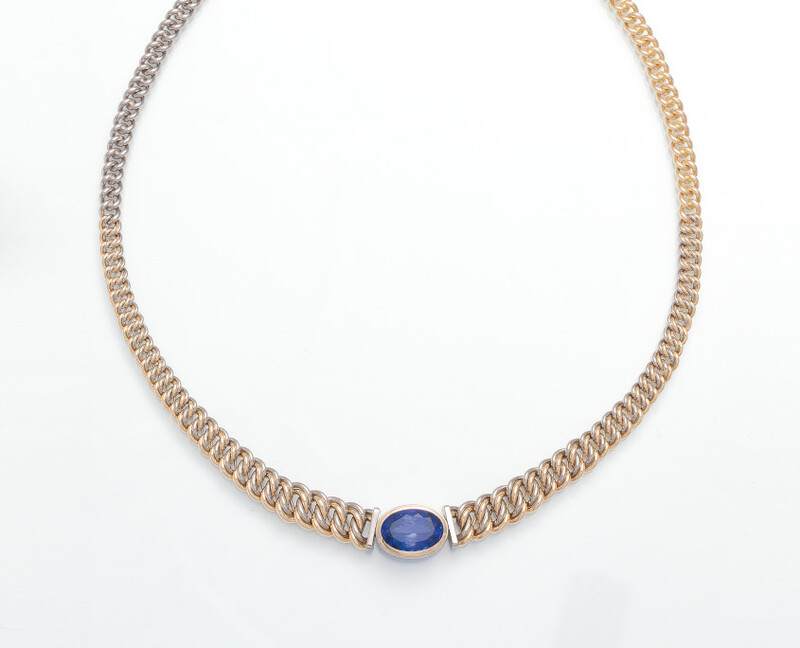 The yellow and white gold bezel setting features a unique ink-blue tanzanite. 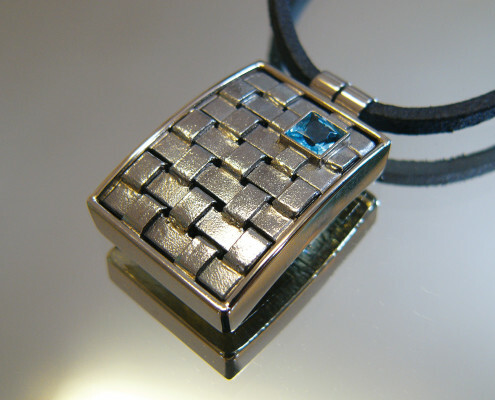 We chose a two-colored box clasp with a safety guard to complete the necklace. 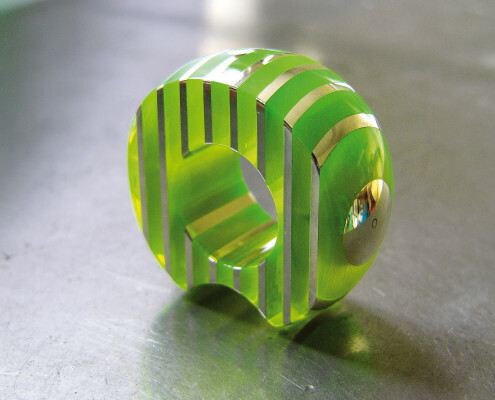 We created this plexiglass ring with pure silver inlay for the Deutscher Staatspreis design competition. For the participation of the German State Contest. 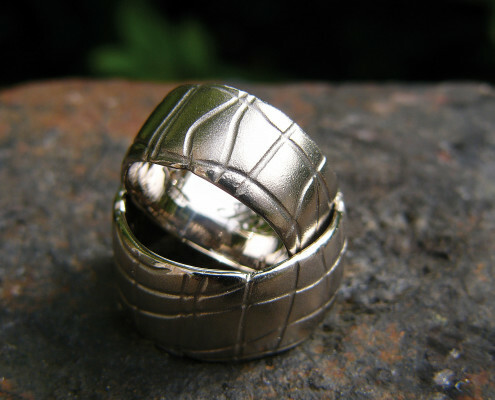 Stainless steel ring with high-tech ceramics. 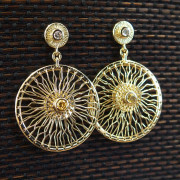 750/000 yellow gold earrings made of more than 300 individual pieces. 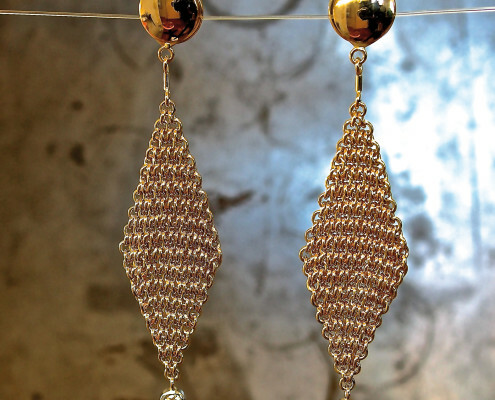 These pendant earrings were a labor of love and wear like cashmere on the skin. 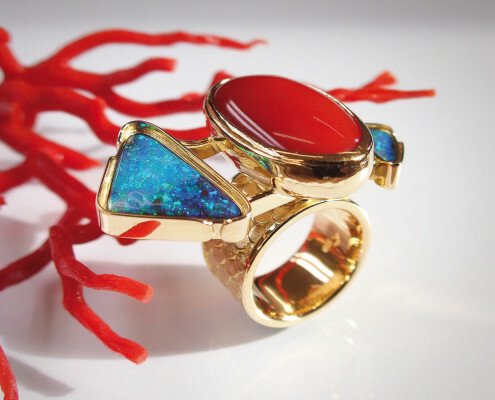 This precious jewelry moves freely with its wearer. The incredibly fine chain mesh is perfected by two free-moving palladium and white gold bezel settings with 0.13 ct, flawless brilliant-cut diamonds. 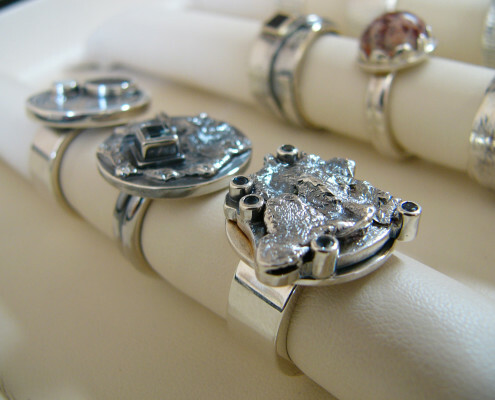 Our silver rings are also hand-crafted custom, unique pieces. 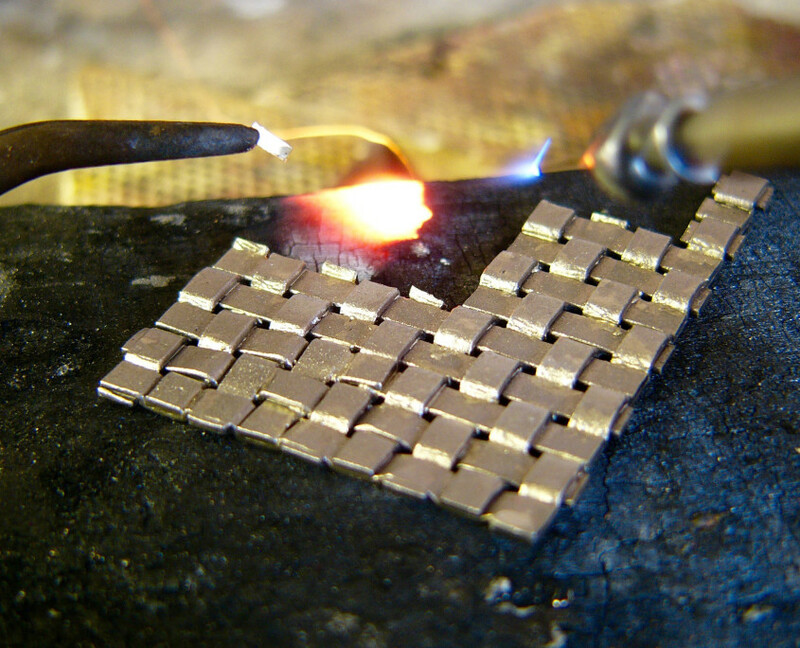 We frequently use silver to test new structures and surfaces. 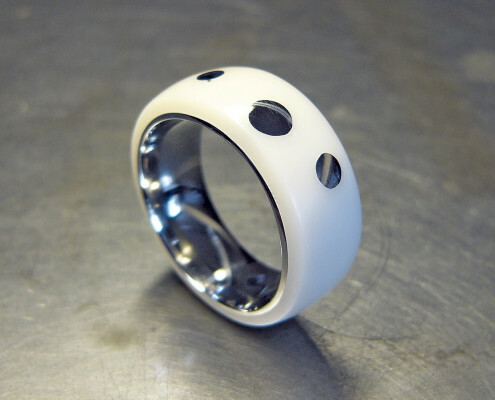 It is used to fashion rings for “Wolfschmiede Beginners” that are extremely popular. Sie wird auf Maß in verschiedenen Durchmessern und Farben passgenau angefertigt. Ausgezeichnet durch den eigens dafür entwickelten WS-Verschluss: sicher, bequem, gut zu handhaben, erlaubt Anhängerösen ab Kettendurchmesser. 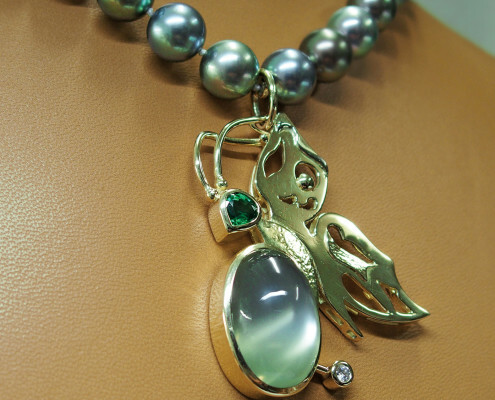 This exceptional pendant shows a butterfly resting in the moonlight. This forged ball clasp made of yellow gold is enhanced with roses fashioned in white gold. 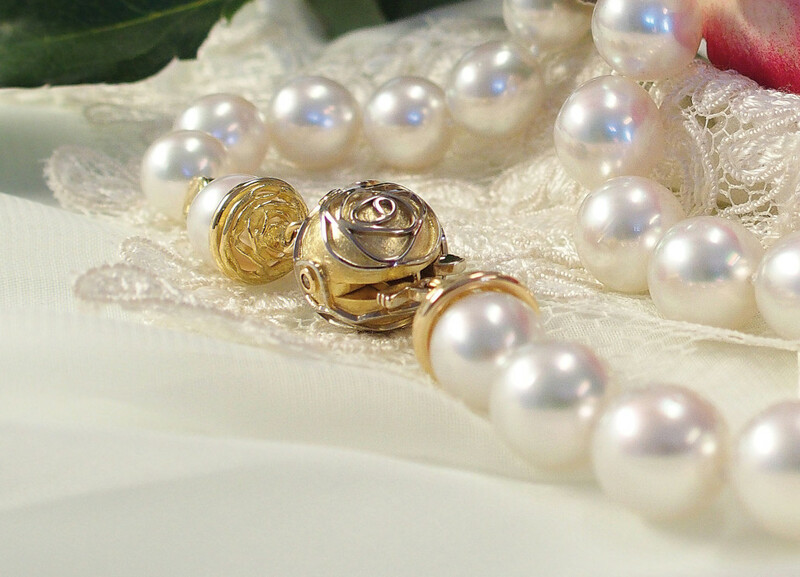 It contains the pearl lock with a pearl hook manufactured specifically for this piece. 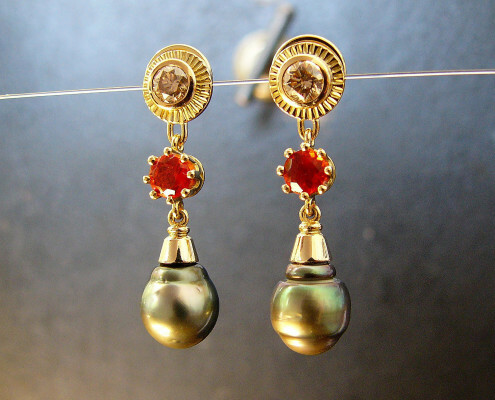 The capsules are also decorated by rose ornaments and link the string of pearls with the clasp. 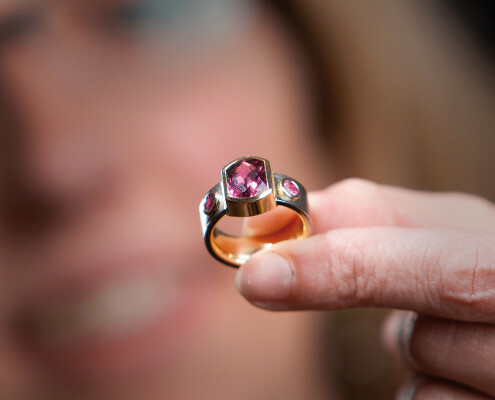 A brilliant-cut pink tourmaline in an elegant four-claw setting that enhance the stone’s radiance. Our signature, hand-crafted Wolfschmiede chain graces the classic ring band. 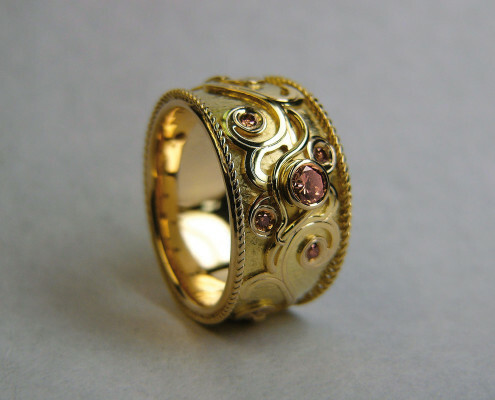 This 18k yellow gold women’s ring was built up in multiple layers adding different design elements. The turquoise-colored Nigerian emerald is an outsider in the stone’s color spectrum; we instantly fell in love with it. It is enhanced by a perfectly cut, flawless brilliant-cut diamond. This project challenged us to depict delicate rays of sunshine embedded in a solidly constructed piece of sun-themed jewelry. The hub at the center picks up the golden thread while also serving as the setting for the natural yellow brilliant-cut diamonds. 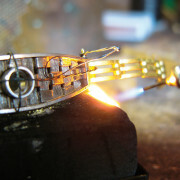 An outer wire picks up the thread and outlines the sun. The extremely technical implementation of this theme recedes into the background when viewed as a whole. The top elements are almost coarse in structure and contrast nicely with the finely wrought sun disks.